Xu: Then it should be smaller than this number [of executed prisoners]. Another reason is. Due to the sensitive nature of organ sources and financial incentives, the number of transplants is falsified level-by-level, all the way down to individual hospitals and doctors. As a result, the true number of transplants performed in China may forever remain unknown. The organ harvesting crimes are ongoing. Under the current conditions of secrecy and deception, we cannot offer a single absolute number for the annual volume of transplants or offer even a close approximation. As a Chinese saying goes, “paper cannot wrap fire.” Such a long-lasting, nationwide massacre cannot be concealed forever. While we cannot directly observe the number of transplants these hospitals have performed, we can still make extrapolations based on capacity, growth, transplant types performed, hospital bed count and utilization rates, professional personnel, and so on. Moreover, regulations published by the government provide useful information in determining the scale of transplant centers nationwide. This report focuses on the 164 hospitals that received approval from the Ministry of Health in 2007, so we can categorize their qualifications as either national or regional level. If we exclude the 18 heart and lung transplant centers, 146 transplant centers remain. Among the first approved group in 2007 were 26 national-level military and armed police hospitals, 52 national-level civilian hospitals and 68 designated hospitals. Among the 566 transplant centers that did not receive approval from the Ministry of Health, 405 were based in large-scale 3A hospitals. These included 56 military and armed police organ transplant centers, 349 mostly-3A civilian hospitals, and 161 medium-sized hospitals (including 55 Class 3 Grade B and C hospitals and 106 mostly Class 2 hospitals). We looked at the total possible transplant volumes that could be performed by these 712 liver and kidney transplant hospitals using the minimum capacity requirements issued by the Ministry of Health for permitted transplant centers. For hospitals approved to perform liver and/or kidney transplants, we calculated the minimum transplant capacity using the Ministry’s minimum bed requirements for maintenance of certification. Based on an average one-month hospital stay, each bed could accommodate up to 12 transplant patients per year. In practice, kidney transplants generally require one to two weeks whereas liver transplants require three to four weeks of hospitalization. Since we are mixing kidney and liver transplants in our volume analysis, we use the maximum hospitalization duration of four weeks as the average length of stay for each transplant patient. Our survey of 165 hospitals found widespread facility constraints, including transplant centers with bed utilization rates exceeding 100% and a long list of patients waiting for transplants. It is important to note that Huang Jiefu has publicly announced plans to expand the number of approved transplant hospitals from 169 to between 300 and 500 and to train 400 or 500 more young doctors. This suggests that the current system-wide capacity cannot keep up with demand.14 15 16 Thus, we are confident in assuming that the vast majority of the existing hospital capacity is being fully utilized to perform transplantation surgeries. Given 100% bed utilization rates, our calculations indicate that all 146 hospitals combined could theoretically conduct 69,300 transplants per year. After 2000, liver transplants gradually became a routine clinical procedure in China.17 Soon thereafter, kidney transplants also began to be carried out on a large scale with a few kidney transplant centers already exceeding 1,000 kidney transplants. Since many liver transplant centers also conduct kidney transplants, the rapid increase in the number of kidney transplants compensate for the relative delay in scaling up liver transplants. We then multiplied annual figures for the approved hospitals by fifteen (years), excluding the year of 2000 as ramp-up time. Following this method, we estimate that the total transplant capacity in approved centers over the 15-year period between 2001 and 2015 is 1,039,500. Table: A volume scenario of 146 hospitals permitted to conduct transplants, based on transplant bed count requirements by the Ministry of Health. All of the 3A institutions located in large cities are required to have over 500 inpatient beds.18 There are cases of centers in medium-sized cities performing 100 transplants within three months,19 which would equate to 400 surgeries per year, assuming a constant rate. All 405 hospitals in this category are 3A hospitals with larger capacities and greater demand. As there could be great variations in transplant volume from hospital to hospital, we set the baseline for each large-scale hospital at 100 transplants per year. This group includes 161 medium-size transplant institutions, 55 Class 3 Grade B hospitals, 106 Class 2 hospitals, and a few smaller ones that also conduct organ transplants. These hospitals usually perform more kidney transplants, which have lower technical requirements than liver transplants. Many of these hospitals have performed far more transplants than the minimum volume, with some performing hundreds per year. Before the Ministry of Health released its list of 164 approved transplant centers in 2007, transplant centers across China had been qualified for transplantation by various assessment departments. For example, the minimum requirement for a qualified kidney transplant center in Guangdong Province in 2003 was to conduct at least 50 kidney transplants per year.20 Between September and December 2003, 30 hospitals qualified for kidney transplants and 17 for liver transplants. We assume 50 transplants per year for each medium non-approved transplant center. Military hospital transplant centers were minimally affected by the introduction of transplant permits in 2007 and have continued to carry out transplantation surgeries. Many non-approved civilian centers also continued to conduct transplants after 2007, but their individual situations varied. We assumed that all non-approved hospitals stopped performing transplants after 2007 and therefore multiplied the annual volumes for non-approved hospitals only by 7 years (2001 to 2007). Added together, the non-approved transplant centers could perform up to 48,550 transplants per year. Over a period of 7 years, the total could be 339,850 transplants. Table: Estimated annual transplant volume of non-approved hospitals based on minimum requirements. Adding the 1,039,500 transplants performed by approved hospitals and the 339,850 transplants performed by non-approved hospitals, we arrive at a figure of approximately 1,379,350 transplants, which translates into about 90,000 transplants performed per year in China. Table: A transplant volume scenario based on Ministry of Health requirements for permitted hospitals and local regulations for non-permitted hospitals. This discussion is limited to liver and kidney transplants. We do not attempt to estimate a conclusive total at this stage; instead, we present only a minimum range of possibilities, which likely do not reflect the full scale of transplants performed in China. The true scale and magnitude of transplantation surgery in China is left for the reader to conjecture. The reported transplant figures indicate that the total number of transplants performed before 2007 by the 80% of hospitals that have not received permits are comparable to that of the approved 20%. 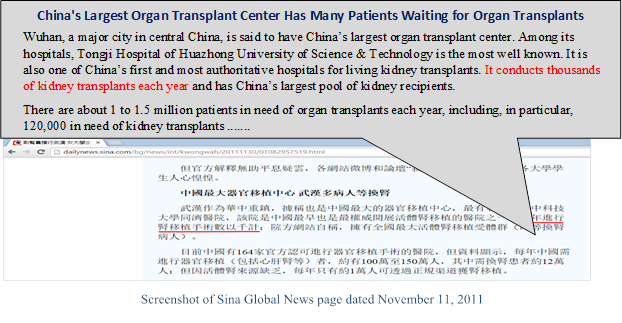 Thus, the number of transplants performed by approved transplant centers constitute only half of all transplants carried out in China. Some doctors and hospitals unintentionally exposed clues of their transplant volumes when talking to the media. These numbers are far higher than the minimum requirements would suggest. Below are a few examples of such reports. In China, everything in the media is subject to either censorship or self-censorship. A media story in China is also a statement that the Party wants published, has allowed to be published, or that the authors and media editors believe the Party would not mind having published. What is true for the media is also, in a sense, true of hospital websites. Although the media is subject to the closest scrutiny, nothing gets posted or published by hospitals without the approval or implied consent of the Party. Media stories about organ transplant volumes in China often inadvertently reveal damaging information when examined in the proper context. Seemingly isolated statistics about organ transplants can provide important evidence of higher transplant volumes than those formally acknowledged. Thoughtless admissions or concessions by the Party/State have revealed that the volume of transplants is substantially higher than the minimum number we determined earlier. Therefore, the total volume of transplants carried out by the 712 liver and kidney transplant centers since 2000 is most likely staggering. "Voluntary organ donation from citizens is the continuation of life under the sun Source: Phoenix Television March 16, 2015 14:28"
"Home Page of Chinese Hospitals Directory"
"There are 20918 hospitals in China in 2010 Source: Xinhua net 2011-08-17"
"Chinese Hospital Class Inquiry System"
"The Difficulty of Legislation in Organ Transplantation Source: Life Week , 2006 Issue 13 / April 17, 2006; Author: Guo Na"
"Wuhan University Research Institute of Hepatobiliary Diseases: A Race against Time Source: www.people.com.cn – Hubei Channel May 21, 2015 Zhang Pei"
"WOIPFG Releases List of 7371 Medical Personnel from 765 Non-Military Medical Institutions Suspected of Harvesting Organs from Living Falun Gong Practitioners, December, 2014"
"Notice from Office of the Ministry of Health on Registration of Medical Departments for Human Organ Transplantation National Health and Family Planning Commission of the People’s Republic of China NHFPC Publication  No. 87"
"164 hospitals in China passed examination and approval by the Ministry of Health to carry out organ transplants Source: China News Net August 18, 2007"
"List of Hospitals Approved to Carry Out Human Organ Transplantation National Health and Family Planning Commission of the People’s Republic of China"
"Notice from the Ministry of Health on the management issuance of the liver, kidney, heart, lung transplantation practices"
"Organ source transformed, however the number of transplant rises up instead of falling downing Source: Beijing Youth Daily, October 15th, 2015"
"“China to have more organ transplantation hospitals.” China Daily. Source: China Daily / Xinhua. May 15, 2016." "Brief Introduction of the Oriental Organ Transplant Center"
"The shifting Chinese health system – World Health Organization Asia Pacific Observatory – 2015 Vol. 5 No. 7"
"China Claims It Would Crack Down on Illegal Organ Transplants Source: Radio Free Asia，Dated: August 18, 2014"
"Notice of issuance of heart transplants and other medical technology projects access standards"
"Kidney Harvesting Gang Runs Wild in Wuhan, Female University Student Killed and Dumped, Family Members of Victims Beaten While Appealing to College Source: SINA Global News November 30, 2011"
"Sharing System Moves Chinese Organ Transplantation into the Public Welfare Era Source: China Economic Weekly, 2013, Issue 34 Liu, Yanqing"
"The First Affiliated Hospital of Sun Yat-Sen University celebrates its 100th Anniversary, Xinkuai Paper, October 9, 2010"
"Japanese Flock to China for Organ Transplants Asia Times – Greater China April 4, 2006 By David McNeill and Clifford Coonan (Republished with permission from Japan Focus)"